Thank you so much for your visit and your support. I've wanted to make comics since I was just a wee lad, and I've spent the last twelve years developing and creating my original comic book, Cursed Pirate Girl. The book is all drawn to scale (meaning I don't enlarge or reduce the size of any of my pages when they're published) and it is inked with a very small brush and india ink. Due to my style of working, production of art and comic pages can be slow - I like to say I'm the Slowest Guy in Comics. The book is currently being published by BOOM! Publications, and they have been unbelievably patient and supportive, despite my snail's-pace production. I've joined Patreon in an effort to bring new, exclusive content and benefits to patrons, since it is sometimes a year or more between production of each issue. By becoming my patron, you'll gain access to pre-sales of original art, limited edition prints, behind-the-scenes looks at my process, sketch galleries, art downloads, and even limited miniature pen and ink commissions. Each patron that supports my page will be directly supporting my ability to continue to create works with the quality and intensity to which you may already be accustomed. This support will also allow me to explore new mediums and source new merchandise as I send out prints and care packages to my patrons. I'm also always excited to share more of my daily life as an illustrator and comic book creator with you. Patreon also allows me to have greater freedom in my exploration of new content. 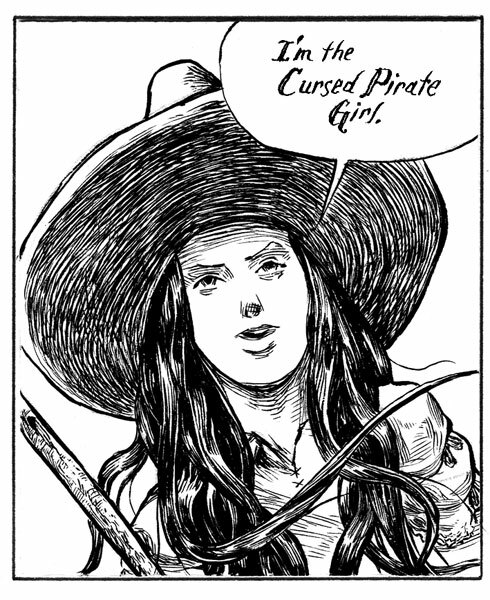 When I draw each new page of Cursed Pirate Girl, I challenge myself to be just a little bit better, and a little bit crazier with my design and ink work. Patron Care-Package - Monthly package of a print, merchandise or other surprise! Exclusive monthly miniature pen and ink drawing of your commission. When I reach 50 patrons, I'll release a special edition, patreon-only mini print, signed and shipped to any patron signed up at the $15 or higher mark. Anyone below that mark will receive access to a digital version of the same piece.